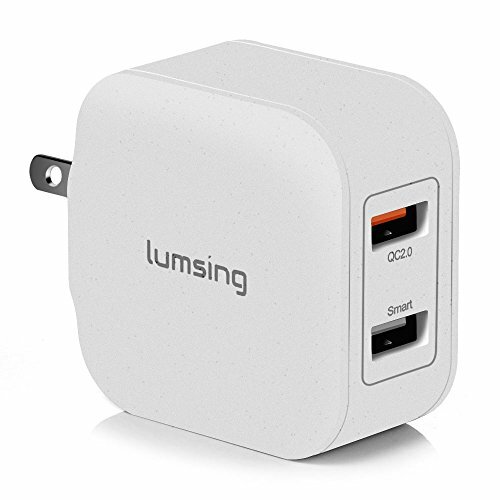 With Quick Charge 2.0 Technology, Lumsing wall chargers charge compatible devices up to 75% faster than a standard charger. Apart from offering blazing fast charging for our expanding number of compatible devices, the innovative charger can also charge older smartphones and tablets not equipped with QC 2.0 technology. -LG G Flex2, G4 and more. BLAZING QUICK CHARGER: This 2 port USB wall charger has a special orange-coloured Quick Charging port that can charge your devices up to 75% faster than the average market charger! This is your go-to charger for those days where you need a charge, but don't have much time. Charge your devices in record time and be amazed. SMART CHARGER: Our chargers think for you, so that you can focus on what matters most: living your life. All 2 ports have Lumsing's Smart Charging technology and will adjust themselves to compatible devices and deliver the best possible charge (up to 2.4 amps). HIGH QUALITY AND SAFE: Phones and other devices are growing more and more expensive with each passing day, so safety is one of our biggest concerns. Our chargers have a built in multi-protect system that ensures the safety of your devices. This system includes a heat-sink, so your phone won't overheat while charging. CONVENIENT AND TOUGH: Our chargers are built with convenience in mind. Tired of those huge, clunky chargers? Try out our chargers; they're small enough to carry in your pocket, but tough enough to be dropped or stepped on and continue working. WARRANTY: All Lumsing branded products have a 12 month warranty that begins on the date of purchase. If there are any product quality problems, please feel free to contact our customer service agents for help.